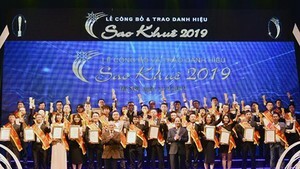 Innovation, Creativity and Start-up festival in the central and central highlands region 2018 was kicked off in Hue City of the central province of Thua Thien Hue yesterday. Highlights of the event are conferences to link in building start-up ecosystem, innovation and creativity in the central and central highlands region. An exhibition about innovation, creativity and start-up featuring 24 projects, start up ideas, innovation and creativity from the provinces of Nghe An, Quang Tri, Quang Nam, Dak Lak and Danang City was also launched during the event. Besides, 21 products and start up ideas competed at start up contest. ​Innovation Creativity and Start-up festival in the central and central highlands region 2018 Hue City of the central province of Thua Thien Hue yesterday.